There are 16,000 opioid deaths per year in the United States and this is a distinctly American tragedy. Every do-gooder and their brother out of central casting, navy blue suit, white shirt, understated tie, American flag lapel pin, agrees we need to legislate the heck out of this problem. Even if their actions have more unintended negative effects than positive, they cannot stand to stand idly by; cannot stand the inactivity that might go along with the actual thinking and the formulation of a real complex response to a real complex public health problem. The need to do something and appease the angry and bereft families of the lost through government activity – even if it negatively impacts 70 million people with legitimate chronic pain – it’s in the news virtually every day. Rescheduling, state pain laws, state run databases, presidential candidates and politicians dictating medical practice while saying stupid, unproven trash about gateway drugs and heroin – commonplace. There are 30,000 plus gun-related deaths per year in the United States and this, too is a distinctly American tragedy. And every pandering do-nothing straight out of central casting, navy blue suit, white shirt, understated tie, American flag lapel pin agrees we need to do nothing – that government activity is fruitless and will only hurt the legitimate gun owners and won’t affect criminals and bad guys. The fear of the National Rifle Association and its 5 million members leads to a complete stalemate as they stand idly by watching more and more innocent people get mowed down while they were doing nothing more than trying to better themselves and offer the angry and bereft families of the lost condolences, candlelight vigils, prayers, tears, and Fill-in-the-Blank Strong tee-shirts. Columbine Strong, Aurora Strong, Sandy Hook Strong, Charleston Strong, UMPQUA Strong……Illusions of strength and unity while we stand back meekly as our kids and neighbors are lambs to the slaughter. 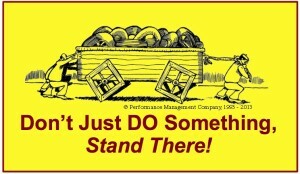 If you are going to cause people with pain harm, here are some words to live by: Don’t just do something, stand there. Perspective is something required, so you stop doing things that are dumb. For every granny doing the pharmacy crawl in Florida who can’t get her 3 hydrocodone per day for crippling arthritis because laws meant to protect those misusing opioids have negatively impacted her – I want to ask how did the Oregon shooter amass 13 guns, an assault rifle among them, while the army knew he was nuts, his neighbors knew he was nuts, his mother was equally nuts – because God forbid we stop him from having guns with laws against alienated losers getting guns as they might negatively affect the hunter next door. And here is the strategy behind their Collective Bludgeoning: Never give an inch. Never. Background checks? Forget about it. Bans on assault rifles? No way. Yet we in the pain community are subjected to a government response that is nothing less than the magnitude of suggesting a complete repeal of the second amendment to the gun toting community. Some people’s rights to gun ownership are trumping others’ rights to the pursuit of life, liberty and the pursuit of happiness. No response from Big Bother to the owners, dealers, makers. But Big Brother is all over our pain medications, doctors, drug companies. The right of some people for pain control is trampled on daily. The inequities of the government responses, driven only by political expedience is, in a word, unreal. I am not arguing for anarchy in the opioid space. Two wrongs don’t make a right. But can we learn anything from their tactics? Are we being too reasonable? Are we too pilloried to wear our problems and their unpopular solutions openly? Should we force our politicians to learn what the right positions are and represent us and fight for us or we will throw the bums out? Do we not recognize when we are trying to collectively bargain we are being collectively bludgeoned when we concede ground. Any ground. Thanks for the timely post, Dr. fudin. Some great comments, too. I am astounded though, by some of the minimizing of violent gun deaths by some, and simply astonished by the feelings that the over zealous (& unscientific) OVER regulation of prescription opioids is merely an “inconvenience” for legit patients, or an “unfortunate distraction”. The patients being harmed by this are NOT the previous patients of the now defunct Florida pill mills. I’m sure many of them have probably moved on to Herion, like most people who were abusing prescription opioids due to addiction. I also think it’s great that America has started to wake up to the fact that addiction is a disease. One that needs medical treatment, and won’t get solved by throwing people in jail for decades. What I have a problem with is the fact that it is the people with addiction to opioids, many of whom took them non-medically, illegally, deliberately & unlawfully… whose lives are suddenly being valued above people’s lives who have serious, disabling pain conditions. The only good thing about addiction is that there hope for recovery. People can go into “remission” from this deadly disease, recover, and begin again. I’m not minimizing that effort, but it certainly is an available option for addicts who WANT it. This isn’t so for people like me (and many others) who suffer from extremely painful medical conditions for which there is NO CURE. Our pain is life long, intractable, and progressive. Without opioids, we have no lives. I’m talking about “can’t catch your breath”, excruciating pain… every day. The kind that only responds to opioids, despite years and years of trying alternatives. It is people like ME that cannot find doctors to treat them. Doctors are terrified of patients like us. Doctors are now terrified to treat pain with opioids. Pharmacists and doctors are terrified & are abandoning patients. It is happening to the sickest of the sick. For these people, it is NOT an inconvenience… It is TORTURE. Wouldn’t it be great if people took “life, liberty, and the pursuit of happiness” as seriously as they took, “the right to bare arms”? Give me a damn break! With respect, appreciation, and gratitude for your advocacy, Dr. fudin. If we had a mental health NETWORK ( not staffed by 26 year old world changers with a BS ) and background checks that are resonable 90% or more of our ” epidemics ” would go away . So now what everything sounds good I have been a cronic pain patient, since 1993 when i had both hips replaced do to being hit head on by a drunk driver in 1987 my right hip dislocates at leasr every other month had 7 revision surgeries to fix it . But with all the new laws i cant or they wont treat me hear in Texas at all yes being an retired police officer i do own guns but now i look aat them as a way out of my pain that i have been living with for 19 years and im 59 so what statistic do i want to be in.???? I hear very informed, intelligent . . . distinguished even! (Volcker, Shultz, Branson, Zedillo, et al – globalcommissionondrugs.org) voices speaking out on the Drug War, decriminalization, legalization (?! – Yes, the Global Commission on Drug Policy is calling for the UN to change the Single Convention on Narcotic Drugs to allow member states to experiment with legal regulation of drugs – meaning no more having to go to a clinician with a D.E.A. license for permission (oopss, I meant prescription, sorry!). Does this sound crazy in our insular, puritanical, temperance-soaked political environment? Of course. I gotta wonder though – Why do I never see any evidence of the “End the Drug War” people talking to and working with the “stop stigmatizing patients with CNCP” people? Mexico’s leaders are crying foul, if we would listen. Is no one aware of the slaughter south of our border caused by the Drug War? That was 25 years ago, and we’ve barely moved an inch toward ending the Drug War, which is “not a war on drugs. It is a war on people!” (Ruth Dreifuss of the Global Commission) You’re not going to get 70 million people to agree on anything in the polarized political environment on this country. That would be like herding cats. You might get 1000 or more to stage civil disobedience by openly flouting draconian drug laws that started with the temperance movement and the Anti-Saloon League. Lafayette Square in front of the white house would be a good place. Good luck getting press coverage though. Maybe Andrew Kolodny could tell us how to get on WBUR On Point to cry about how the FDA just made it possible to create a new generation of addicts now that “big bad pharma” can market Oxycontin to pediatric patients. If nothing else, put UNGASS on your radar. They are meeting in April 2016. United Nations General Assembly Special Session. Will Rogers once said: “The short memories of American voters is what keeps our politicians in office.” Considering the number of former world leaders on this Global Commission, Rogers could well have been thinking about the rest of the hemisphere, if not the rest of the world. Let’s look at just two of these Commissioners: Cesar Gaviria and Ernesto Zedillo, ex-presidents of Colombia and Mexico, respectively. In the early 1990s, Mr. Gaviria protected the head of the Medellin Cartel, the infamous Pablo Escobar, from being extradited to the U.S. where he was under indictment for smuggling tons of cocaine and heroin. Under considerable pressure from the international community to reign in this murderous narcoterrorist, Gaviria offered a plan for Escobar’s surrender. Gaviria had become president of Colombia in 1990 after Luis Galan, the more favored candidate, was assassinated – reportedly, although never confirmed, on orders from Escobar. Fearing extradition to the U.S., Escobar spent a fortune to elect politicians and influence judges to change the Colombian constitution to prohibit extraditions. He succeeded in getting this done during Gaviria’s administration. To assuage critics at home and abroad, Gaviria devised the abovementioned surrender plan to have Escobar plead guilty to drug-related charges and be imprisoned for a brief period. This, in turn, would mean that under international law, Escobar would be immune from extradition to face similar charges in another country, including the U.S.
Escobar’s relationship with Gaviria doubtless was complex but we know one thing for certain: at some level Gaviria believed he could negotiate successfully with a murderous criminal who, according to Colombian officials, was responsible for the murder of at least 600 police officers, scores of journalists, politicians, judges, and other government officials, dozens of shoppers at a mall that he and his henchmen fire-bombed, 125 passengers and crew on a Colombian airliner that he arranged to destroy in midair, and dozens of small children in Bogota who met a fiery death when their school bus was intentionally blown up as a show of force by Escobar and his ruthless thugs. When these horrific crimes were committed, it has been alleged, it was to force the Colombian government to stop extraditing members of Escobar’s drug cartel to the U.S. In the mid-1980s, during his meteoric rise to head the Medellin Cartel, Escobar was listed by Forbes Magazine as one of the world’s seven richest men, with assets estimated to be in the range of $25 billion. It was reported that on one occasion Escobar had offered to pay off Colombia’s entire national debt of $10 billion in return for being left alone to run his drug empire. If there is one thing feared above all else by drug cartel leaders like Escobar, it is extradition to the U.S. where they know full well that, if convicted, they will spend the rest of their days locked away in a maximum security prison cell. In the years since Gaviria left office, his successors have authorized extraditions and renditions of drug kingpins to the U.S. and, over the course of the last two decades, hundreds of them have been extradited to the U.S. where they remain safely confined. Colombia, at long last, has emerged from the dark days when the cartels and narcoterrorists literally controlled the country. To be sure, Colombia continues to have national security problems but they are miniscule today compared with when Cesar Gaviria was president. Ernesto Zedillo, as president of Mexico from 1994 to 2000, like Gaviria, presided over his country at a crucial time when the Mexican drug cartels were beginning to take over. We have to ask ourselves today, what more could have been done during this time by Zedillo and his administration to prevent the slaughter we see today in Mexico. Drug cartels are like multinational corporations; they do not simply arrive on the scene one morning and take over but, instead, they begin as small entrepreneurial enterprises and grow quickly. They expand horizontally as they establish new markets, supply chain networks, transportation hubs, and authorized subsidiaries and franchisees. Once established, they are difficult to eliminate. Thus, the best strategy, indeed, the only viable strategy, is to prevent them from ever getting started in the first place. Contrary to the findings of the Global Commission on Drug Policy, this can be done only by keeping their activities illegal. I will leave it to others to decide if Gaviria and Zedillo, as well as some of the other members of this Commission, are acting in good faith, albeit naïve, or simply continuing to advocate failed policies that led them to believe they could negotiate with these elite and wealthy special interests called drug cartels. The Commissioners speak of needing to protect the little people but in their thesis they represent the interests of the big people, the really big people who are the billionaire criminals running global crime cartels that would expand and flourish if their businesses were legalized. This is not a peasants’ revolt, for the peasants better than most understand firsthand the horrors of drug abuse. Many, if not most, of the members of this elite Commission are themselves very wealthy people whose privileged lives are protected around the clock by armed guards, their every move made gentle by their status and wealth, and their cares and the cares of their families minimized by the perquisites of their fame and fortune. They live a life that is far removed from that of the typical user of the poisons that they would advise us to legalize for our own good. They are where they are and given the voices they have only because the rest of us, as Will Rogers noted, have short memories. We were foolish to listen to them before; let us not make the same mistake again. As for the use of the useless “War on Drugs” metaphor, this, too, is a mistake of sorts. Some years ago I traced the origin of this expression to a 1912 editorial in the Washington Post that was supporting what eventually became the Harrison Narcotic Tax Act of 1914. The actual language in the editorial called for a “war on drug abuse.” Elizabeth Washburn Wright, the head of the American “observer” delegation to the League of Nations opium commission used the expression “war on drugs” in 1925 when she returned from a contentious meeting of the League. President Nixon is often credited with coining the expression but there’s little evidence of this. He did call for a “war on crime” and cited drug crimes as high on his list of priorities. The idea of “wars on” this or that has always been part of the politician’s vocabulary. Herbert Hoover had a “war on waste,” JFK/Lyndon Johnson had their “war on poverty,” Nixon did actually declare a “war on cancer” in 1971, Sir Elton John in 2011 copied the pols with his declaration of a “war on AIDS,” comedian George Carlin joked about his “war on the homeless,” and John Lindsey, when he was mayor of NYC, declared a “war on pigeons,” and, more recently, his successor at City Hall in 2008 declared a “war on trans-fat.” What all these “wars” have in common is that none has been “won.” So, if you’re going to use the trite cliché of bashing the mythical war on drugs because it hasn’t been won, then perhaps you should ask yourself if you would apply the same response to the un-won war on cancer or AIDS or poverty, etc. Factually, all these wars with the exception of the wars on pigeons and the homeless are metaphors for prioritizing serious social and/or disease states worthy of our attention. We can continue the difficult and challenging task of trying to solve these problems or we can capitulate and adopt the failed policies of the aforementioned failed world leaders and their inane recipe for global disaster. Which would you prefer to have? Thanks for the heads up about Dr. Hart! I’ve seen him debate O’Reilly, lol. (Poor Bill was in WAY over his head). Imagine?…Someone who believes that policy should reflect EVIDENCE! I didn’t realize he had a website, so thanks for that! I think it is highly unfair to use a statistical comparison of gun related deaths with opiate related deaths. Aside from comparing apples to oranges, it is unfair to quote a statistic of 30K+ gun related deaths v. 16K opiate related deaths. Where your number jives, HOWEVER, of the 30k+ (33,169 in 2013) to be accurate, only 11K+ were attributable to homicide where there was an intent to kill another. More impressive was the gun use for suicide at 21k+, however, that number must be deducted and removed from the 30k+ you utilized because even if guns were not available, they would likely have committed suicide by other means. There are an additional 1k +/- accidental / unknowns. Back to the 11k+ of homicides. Take a wild guess at how many of those homicides were committed by law abiding gun owners ? I don’t know either as I wasn’t able to easily find a statistic anywhere, but if I had to guess, I’d say next to none. Accusing politicians of doing nothing more than literally upholding the Constitution yet claiming their only reason for doing so is because they are under some kind of duress from the NRA and my fellow firearms owners as a comparison to government regulation of opiates, again, apples to oranges and extremely off base. Perhaps you could have used vehicular homicides by drunk drivers instead as an example of how a government regulates and legislates, yet cannot control usage of a vehicle by drunk drivers ? While your points about government intervention in areas it has no business intervening, like gay marriage and who must bake cakes for them for instance, are well taken, the anti gun undercurrent and connotation did not go unnoticed, and in my humble opinion, actually took away from the positives of your advocacy. You could have simply stated your case and not even mentioned guns and you would have had a very good blog. Heaven help me for saying this, but we do need a movement. 70 million, 100 million, 132 million, or the latest deflated figures. Whatever that number may be, we are a force, but only if we act as a force. Many pain patients are hip to what’s happening — we see them on social media. But the vast majority of people in pain are simply being wasted in this senseless war. “Cannon fodder” was the term used by a sympathetic friend earlier today. These people are unaware of the big picture. They only know that they hurt. I remember when this system worked. Jeff, you’re right — we need to use the political power we have in numbers to effect the pendulum swing back where it belongs. Maybe I’m just under medicated tonight, but unless we can get the word out to those 70 million about why they can’t seem to get the pain care they received five years ago, we’ve got no power — just 70 million victims. How many pain patients are we reaching with these tools? Not 70 million. What is the most effective method for reaching the 70 million and explaining the barriers to treating their pain? Rock on my friend. If only all pain specialists would speak up for the patients they serve. Jeff: Perhaps it’s time to pause and reflect upon some outcomes that are relevant to this discussion. By the late 2000s, the Ryan Haight Online Pharmacy Consumer Protection Act of 2008 had greatly reduced rogue Internet pharmacies selling opioids without prescriptions. Some of the criminal organizations behind them moved to Florida because of lax regulations and opened pill mills disguised as pain management clinics. I have a photo of a sign that appeared on one of these places and it closely resembles the comic graphic in your piece about gun sales without background checks. The sign in my photo reads: “Pain Clinic Health 1 Wellness, 700 Ives Dairy Road, North Miami, FL 33179. $49.00/Visit. We are the Best! NO MRI REQUIRED, NO MEDICAL RECORDS, NO PHYSICALS, WE DISPENSE NARCOTICS ON SITE. 305-690-9784” Signs and ads like this were frequently posted in flyers and local newspapers. By 2010, the Florida Attorney General was estimating as many as 1,000 pill mills operating in the state. One famous case involved a clinic owned and operated by two gangsters with prior felony convictions. Five medical doctors employed at this “clinic” earned an average of just over a million dollars each a year. In 2010, when this pill mill was raided, the authorities seized $5.8 million in cash. Now, let’s fast-forward a few years to 2011 when the state legislature after declaring a health emergency enacted legislation that effectively overnight closed down almost half the pill mills in the state. Besides tightening the rules on the ownership of the pain clinics, prohibiting doctors from dispensing controlled substances from their offices, and requiring pharmacists to report fraudulent scripts to the local sheriff, the new law improved the state’s PMP and added a number of other rules. We are now more than four years out from when these changes went into effect and it is appropriate to ask ourselves whether the 2011 legislation in Florida was worth it. This past July, the CDC published a report titled: “Decline in Drug Overdose Deaths After State Policy Changes — Florida, 2010–2012.” It’s worth quoting from the abstract: “During 2003-2009, the number of deaths caused by drug overdose in Florida increased 61.0%, from 1,804 to 2,905, with especially large increases in deaths caused by the opioid pain reliever oxycodone and the benzodiazepine alprazolam…. During 2010-2012, the number of drug overdose deaths decreased 16.7%, from 3,201 to 2,666, and the deaths per 100,000 persons decreased 17.7%, from 17.0 to 14.0. Death rates for prescription drugs overall decreased 23.2%, from 14.5 to 11.1 per 100,000 persons. The decline in the overdose deaths from oxycodone (52.1%) exceeded the decline for other opioid pain relievers, and the decline in deaths for alprazolam (35.6%) exceeded the decline for other benzodiazepines. Similar declines occurred in prescribing rates for these drugs during this period.” [The full report can be found here: http://www.cdc.gov/mmwr/preview/mmwrhtml/mm6326a3.htm%5D. To be sure, these life-saving accomplishments have no doubt brought with them some difficulties and inconveniences for legitimate patients, especially those that may have obtained treatment at the now defunct pill mills. Providers are realistically suspicious when a new patient arrives after having been treated at a closed pill mill. Pharmacists, likewise, may have some reservations. Some of these difficulties result directly from the new rules themselves while others are related to the phenomenon of change that often creates uncertainty until those affected by the change adjust. In any case and for the benefit of all those expressing angst over the new rules, let us pause for a moment and rejoice in the many lives saved and, at the same time, give a little credit to public officials in Florida who, against the wishes of a number of special interests and professional organizations, made some tough calls to improve the public health. Thank you again for all of your comments. It seems that every time I read them I learn something new, or at least some history I didn’t know. I agree that Florida made lots of headway at closing down the “pill mills”, but at what expense? And, lets not forget that if politicians and lawmakers were doing their job from the get-go, they wouldn’t have been in this mess. That said, the recent State Medical Examiners report showed a 119.7% increase in heroin related deaths at the same time that prescription opioid deaths diminished. If some legit patients used heroin, this presents yet another health risk of increased hepatitis C, HIV, and infectious endocarditis all from dirty needles. The whole issue is a nightmare and very complex indeed. Jeff, you know you are my Superman! After reading all the comments, I’m not sure people understand how bad the problem is especially in Florida. I’d be afraid to put an opioid bumper sticker on my car! Pharmacists routinely deny filling valid prescriptions. What I find puzzling is pain practitioner’s prefer to change their patient’s prescription to a less potent medication than to face the pharmacist and insist the prescription be filled. Couple that with the myriad of pain practitioners who prefer risky procedures over prescribed opioids, who’s left to champion the cause? Interesting analogy Jeff. I’d like to add to that if I could. 1. In the gun community, background checks are encouraged for all and required for some situations. This is to make sure firearms do not end up in the hands of the wrong people. The majority of gun owners are incredibly responsible and gun owners are responsible for their own actions. The pain community takes a history from patients and we are encouraged to do a risk assessment prior to prescribing opioids for ANY patient. This is to help guide a decision about how safe it would be to provide the medication (for the patient and anyone close to them). It is completely irresponsible to just give a medication to someone because they request or demand it (not opioids, not Viagra, not antibiotics). 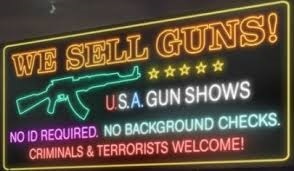 This is not retail where you get to choose the firearm of your choice. 2. Mental illness has been universal with the mass shootings. We know that the majority (up to 70%) of our chronic pain patients have, at the very least, depression associated with long-term suffering. If someone is at very high risk of hurting themselves or others, providers may choose not to provide opioids. If there is moderate risk, providers may choose to follow-up more closely to make sure no harm comes to the patient or someone in their life. The point being, health care providers are responsible for and invested in their patients and try to use both safe and effective therapies, which may, or may not, include opioids. We go to school and train for a decade in some cases to make those educated decisions, because we hold patients’ lives in our hands. Retailers who sell guns just want to sell product. 3. It is becoming more common to prescribe naloxone with opioid prescriptions in the case of overdose. It’s another safety net that providers use to help keep patients and the public safe. Unfortunately the NRA is not lobbying for everyone to wear kevlar (although I’m sure there is someone out there who would love to make a buck from that). They do advocate for gun safety classes, which is good and all providers are tasked with educating patients about any medication they prescribe, including opioids. 4. We use lots of other treatment modalities for pain (both acute and chronic) in every case. Just as it is difficult to kill a large number of people with a knife, it is also unlikely that a patient or someone in that patient’s life will accidentally overdose on gabapentin. Guns and opioids kill quickly, and have been shown to kill large numbers of people if in the hands of the wrong person(s). 5. If a licensed gun seller does a background check and this is clean, a firearm is purchased and tragedy ensues, is he liable for that person’s actions? No. If a medical provider does a risk assessment and proceeds to prescribe opioids and the patient or another dies from that, that provider will be investigated and, quite possibly, sued. Retail vs. responsibility again…huh. I guess providers carry a pretty heavy burden in this. So my point is, healthcare providers do a better job of keeping patients safe, take an oath to do no harm and are held responsible for their decisions. I agree that legislation just doesn’t help in the end, and as soon as you paint every patient taking opioids like a drug dealer and every gun owner like a mass murderer we have gone too far. However, Americans do not do anything in moderation. So what is the answer? 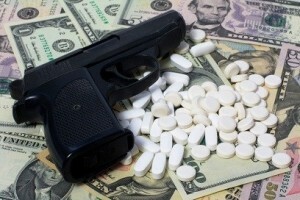 The black market for arms and drugs will exist regardless of what the government or the American people do. All we have control over is our own actions. There are not enough psychologists in the world to help all of us manage our stressors and mental health. Desperation and feeling out of control sometimes lead to emotional decisions and drastic actions, leading to harming ourselves or others (September was not only pain awareness month but also suicide awareness month). We need to find the calm within ourselves to cope with and manage our health and our lives – and of course lock up our guns so accidents don’t happen. It’s the best we can do. Love you comment )as usual) Lee. You provided very important insight! Mental illness or evil? It is a myth that mass shootings are driven by mental illness. They are driven by evil, malignant narcissism, and most importantly, by the desire for the fame and notoriety that inevitably comes with taking lives. Shooters know that today they are no one famous, but tomorrow people all over the world will learn their names and stories and read their manifestos— if only they commit mass murder. That is a powerful incentive. The correct answer is to never report the shooter’s name or likeness unless the failure to do so would pose a direct threat to public safety (such as the shooter being at large.) We all need to never speak these shooter’s names, but remember the victim’s names instead. This shift needs to occur. I agree that there is a huge logical disconnect in how opioids are over-regulated versus the non-regulation of lethal firearms. But, I did want to point out that it is NOT mental illness driving mass shootings, but something far simpler — evil and a lust for fame and notoriety that overrides compassion for others. Data on people who start pain treatment yields the same conclusion: The vast majority don’t misuse their drugs. hits people who are already abusing other drugs. for overdoses containing opioids found that just under 13% had a chronic pain diagnosis. addictions do not start with a prescription—and most opioid prescriptions do not cause addiction. I am always thrilled to see someone stand up for pain medication and people like myself that live with daily pain. Common sense has been left out of trying to come up with a solution to this problem. I so agree with the comment nothing is being said about heroin which by the way is killing kids daily. First of all the people marching on the steps if the White House because their kids died of over doses are middle class America because that is who the opiates are most popular with. How many parents have you seen marching because their kid got addicted to crack or meth. While my heart goes out to these people it amazes me we don’t want the government to tell us how to raise our kids but when our kids get on drugs we want the government to solve that for us? What ever happen to putting responsibilty on the ones that abusing the drugs in the first place? I raised 4 children myself and mine were not saints when I found out my daughter was experimenting with cocaine I didn’t run to Washington I put the heat on HER. It’s your responsibilty to leave this alone it’s your life. But you have a lot of parents out there that can’t do that with their kids.one they can’t hold their kids accountable for any wrong. It’s always someone else’s fault. also they look the other way and deny there is a problem until it’s too late and already so far out of hand. Then they want to blame the pharmaceutical company the government and everybody else. Because God forbid they live with the fact that they missed something or they didn’t have a perfect child. I was on a FB page called I hate heroin and a father who lost his daughter to a heroin OD was on there. My heart went out to him but he posted pictures of his daughter beside a brand new mustang and he said this was her new car I gave her. She totaled it a few months after this picture was taken while she was drinking and driving. Now he is a member of the FEd up rally that rallies against pain pills.sir did you not see your daughter was on a path to self destruction when she totaled the car driving drunk.im not trying to sound cold because I’m not but these are the people pushing to take our pain medication away from us. And no one has set down and said there are people living everyday in pain that need medication. No we have been shamed into silence and submission. Afraid if we open our mouths we will be labeled and send up a “red flag” in the doctors office and he needs to cut me off. My doctor said that to me when I was anxious about my meds being changed he said my anxiety was on a check list as a red flag.that I may be an addict. This after me going to the same doctor “him” for 6 years. I held my breath every time I had an appointment because I was afraid of sending up a red flag. We have been ashamed and made afraid. Made to feel like we are dirty and wrong just because we take a pain pill. And the stigma and ignorance has spilled over into our families who have been saturated with all the negative about opiates. We have little if any support on a personal level and slither into the doctors office for our script and slither to the pharmacy to get it filled. I found my first support on Facebook I looked to see was I the only one. And the more I looked the more I saw others in my same boat. My twitter account is now dedicated to spreading the word that opiates are not the devil and we are entitled to pain relief. I’m ready to help anyway I can. Tell me who to write to where to send the letters. Dr. Fudin, your analysis reminded me of a question I posed many years ago to Kurt Schmoke, the then-mayor of Baltimore and Joseph McNamara, a former police chief of San Diego, CA. Both were arguing in favor of stricter gun laws, citing the violence in Baltimore (even then) and elsewhere. Both also were advocating the decriminalization of drugs, claiming that the “war” on drugs was fueling the violence. The question I posed was focused on the incongruity of their positions. If strict drug laws don’t prevent drugs from reaching society, I asked, how will strict gun laws prevent guns from reaching society? Rather than answer my question, former chief McNamara called me an “NRA nut” looking to protect his gun rights. The audience, clearly anti-gun, applauded loudly as I took my seat. But, the question was never answered. And, I was not then, nor now, a member of the NRA. Something similar to the question I posed those many years ago is present, at least inferentially, in the analogy used in your analysis. That said, I’m not sure if drawing a moral equivalency between gun laws and the regulation of controlled substances is fair. Perhaps it would be worth noting that while both guns and drugs can be, and are, misused, they also provide vital protections and benefits worth preserving. Seriously, blaming the regulations or the regulators for why granny cannot get her three-a-day hydrocodone prescription filled is, in my view, a Chris Rock interpretation of the problem. Why not put the blame on the pharmacist who refuses to serve granny despite the fact she has a valid prescription for hydrocodone? Is this not the real problem here? Practitioners, whether prescribers or dispensers of controlled substances, self-regulate often with far stricter standards than any governmental authority could or would impose. Transferring accountability for these harsh self-imposed “rules” from self to the state is patently wrong and inaccurately identifies the problem. Let’s be honest, if a licensed pharmacist or a registered and licensed prescriber refuses to perform her or his professional tasks as authorized by the state, it may be time for such a person to find a new profession. One of the NRA’s bumper stickers used to say, “Guns don’t kill people; people kill people.” Perhaps we can learn something from the NRA. How about a bumper sticker that says, “Regulations don’t harm people; people harm people”? Maybe the NABP could sponsor such a campaign and pass along free bumper stickers for its members. Thanks for sharing that story. I’m still shaking my head! While I do agree with some of your comments, an important factor that is missing is the “fear-factor” amongst prescribing clinicians and pharmacists whether or not it is justified. Also, in the state of Florida, although without a doubt some pharmacists as you point out are refusing to dispense prescription opioids, many do not have a choice. The reason for that is because pharmacies are limited to purchasing a certain number of opioid units per store per drug while at the same time, legitimate grannies are limited to filling prescription by zip codes. This double whammy has a huge impact on legit patients which is out of the control of licensed clinicians, both prescribers and pharmacists. Jeff: What you say is true but you uncover yet another example of what I tried to convey in my earlier post, namely, the inappropriate and unnecessary self-restrictions being placed on the drug supply by those we license and register in the interest of delivering regulated medications to patients. There is no law, federal or state, in Florida, or anywhere else for that matter, that limits the distribution of controlled substances to pharmacies. To be sure, there are laws that require wholesale distributors to identify suspicious orders and report them to DEA. The law defines “suspicious orders” as “orders of unusual size, orders deviating substantially from a normal pattern, and orders of unusual frequency.” [21 CFR 1301.74(b); also, 21 USC 823(b)] The “big three” wholesale distributors have been heavily fined in the past several years for distributing suspicious orders amounting to tens of millions of scheduled drugs to pill mills, rogue Internet pharmacies, and pharmacies accused of diverting drugs. These cases were based on egregiously suspicious orders that were filled and never reported to DEA, as required by law. It has been reported that some distributors are now improperly withholding supplies and citing federal regulations or “the DEA” as the reason. At least one major distributor that I know about has been officially advised by DEA to cease spreading these false reports to its pharmacy customers. As for the fear factor that you mentioned, the best antidote for fear of anything is knowledge. A recent GAO report on this subject recommended improved communications between DEA and its registrant community to avoid the very problems you describe. For its part, the DEA told GAO investigators that it provides annual educational seminars for distributors and others in the supply chain to familiarize them with the regulations and to clarify their responsibilities as registrants. The GAO investigators found that these seminars were poorly attended by the very folks who might have benefitted most from them. In short, we can blame fear all we want but that is no excuse for willful blindness in face of facts and knowledge. The chief purpose of the regulations is to protect public health but that cannot be done if the regulated entities themselves do not understand the law or worse, decide for themselves to self-regulate in ways that, as you and others here have pointed out, harm patients who are in need. I do not disagree with your definition of the problem but I do disagree that the cause of the problem is the regulations. The cause of the problem is that those who are regulated for whatever reason or reasons simply do not wish to follow the regulations but, instead, impose their own version of the regulations, which, ironically, often is far more harsh than any regulation that a governmental body would be able or empowered to impose. I, for one, would like to see the pharmacy community direct its attention (and ire) to those pharmacies that are found refusing to dispense controlled substances to patients presenting a valid prescription. Yes, there are regulations that allow a pharmacist to refuse to fill a prescription but only when the validity of the prescription is in question. The same regulation, in my view, does not allow a pharmacist to refuse to fill a valid prescription for no reason. Doing so, again in my personal opinion, might constitute grounds for federal authorities to challenge the registration with a show cause order, inasmuch as it might be argued that the pharmacy’s registration is not in the best interests of the public – a basic condition for registration. To its credit, the state of Massachusetts several years told chain supermarkets with pharmacies in the state that they could not arbitrarily impose a 24-hour waiting period on filling certain prescriptions for controlled substances. As I recall that case, the state authorities indicated that state licensure was predicated upon serving the public interest and that this self-imposed company policy, regardless of its intention, ran counter to that. As far as the gun debate vs the prescription drug epidemic in America there may well be many equivalencies – some genuine – some false but the common denominator would seem to be death and emotion. John, I think the answer that could have been provided to your question, at least to begin the discussion is that regulation alone can’t solve these problems. Uni-dimensional solutions for multidimensional problems are never adequate and in some cases, may not even be a good place to start. That said, I’d like to express my concerns regarding the apparent need to “push back” (and in many cases, push back hard) against the forces for over regulation and control. As someone who has seen many respected colleagues live to recant their unreserved “pro opioid” position, I fear that this argument might be heading the same way. Sadly, the simplistic solution to opiophilia seems to be opioiphobia. How we get the pendulum to oscillate about the midpoint is the challenge. To a certain extent, the medical community should, in my opinion accept a large share of the responsibility for the mess we’re in. It couldn’t have happened without a lot of fairly bright people failing to exercise even a basic level of skepticism around the widespread use of opioids. Lets look to the past to help us do better in the future. Doug: Great to hear from you! Yes, I agree and I surely didn’t mean to infer that we can regulate our way out of this problem. But I do think we need some innovative thinking. Your use of the metaphor of the “pendulum” is valuable in this context. It reminds me of Steve Passik’s cry for “balance” (between control of drugs and their lawful use). Steve may not have invented the concept but I do recall his preaching on the subject. In any case, both metaphors suggest a zero-sum game here and that could be what’s triggering all this excitement and angst. In a zero-sum game, every gain for one represents a loss for another. My question to you and anyone else who cares to weigh in is this: is it not possible to work together to reduce the carnage from drug abuse while at the same time ensuring that anyone who needs regulated medication has easy access to it? At some level, both the regulatory world and the medical/patient world join in seeking to save lives and improve the public health. Where, then, does it break down and why is it so hard to bring all this together again? Excellent: Now show me someone running for office to whom I can commit my 1-issue vote pledged to pain relief. Danya (and Mom), Your few words resonated quite strongly with a group of national patient advocates and renowned pain management clinicians. In part because of your comment herein, all of these thought leaders are collectively working behind the scenes to expose politicians for their complacence towards opioid-requiring pain patients that have been victimized. It’s amazing how politicians respond to potential lost votes but not to inhumane suffering. That is the definition of narcissism and “evil” as defined in Dr. Scott Peck’s People of the Lie. After sending the Tweet below, 25 folks from DC area monitored on Google Analytics were observed to be reading the last blog post, Collective Bludgeoning. I think we may be onto something – thank you for lighting the spark! Well said, Dr. Fudin. It has troubled me for years that there is an insurance company and some regulator involved in the health care decisions that need to be made between my doctor and me! … Not strangers with no vested interest in a health care plan that fits PATIENT needs, not special interests. Thank you for your fight! In my opinion, political party ideologies are at the root of the problem! Politicians and private citizens must stand up for their INDIVIDUAL beliefs for changes to occur. Not sure party system works any more. Thank you GF. I believe there is much merit to your comment. My very soul resonated to this, Dr. Fudin. Once again, BRAVO! And you are right about compassion being both the essence of our caretakers and one of the reasons we tend to relate on a different level than the NRA. I have often wondered at the number of guns some males need to amass in order to feel like men. Apparently the very thought of any interference with that perception of power makes them feel naked and vulnerable, and they gather together for the safety of numbers and send out threats. We in the pain community are already weakened by pain and stigma, which is now stigmatizing the very people who would help us. We desperately need this reminder that polite requests to a government that only hears the sound of money cannot be effective. As you say, it is time to make ourselves heard with a loud and powerful voice. We and our caretakers are a huge voting block, and if nothing else we can vote the protectors of mass muderers out and real men and women of conscience into congress. It can be done. A brilliant comparison, Jeff ! It’s a viewpoint that has needed expression for a long time. It is very well, and timely, to ask: “How can 5 million be a stronger political force than 70 million?” Easy to say: amplification. How does a 3-man rock group generate more decibels than a full symphony orchestra? Easy to say: amplification. What makes up volume control in this case? Um… The 5 million have money? They’re not-disabled? They have yet more money for campaign contributions? They’re not depressed and listless and drained by pain day-in and day-out? There is no constitutional right to bear opiates (so how can the legal system work its mojo)? They have even more and more money to spend for lobbying and propaganda spinning? The 5-million have no equivalents to predatory War-On-Drugs government agencies and bureaucracies that will turn gun-overdosing into a source of new appropriations and job security? They may kill people if push comes to shoot? What society has ever failed to vilify, outlaw and punish those who are poor, unable to defend themselves, and —greatest sin of all— unable to grease the wheels of politics as usual? Perhaps our greatest handicap is that Pain Management providers are compassionate, reasonable, open-minded people by nature and not adept at taking and holding an at-all-costs-absolutist position and —most important,— sticking it to the opposition. Yes, pain care is very complex and full of nuances. But asserting the right to relief from pain and suffering is not complicated at all. And sticking it to the opposition (are you listening PROP?) merely (!) takes lots of money, absolute uncompromising dedication a lá the NRA, and a lot more backbone and energy than I have seen in the Pain Management provider community and 70-million sufferers to date. Needed: A summit conference of the top 10 pain management professional organizations and the top 5 patient advocacy groups to unite behind, and copiously fund, a core pain relief lobbying organization that will be capable to counterbalance and out shout the forces behind opiate rationing and denial. Allen, I know very little about guns, but I know they kill. Perhaps there needs to be a cry out for “abuse deterrent guns” that require pre-registration and a finger print activated trigger. How do you think that would sit with politicians? However gun owners don’t have the issue of seeking treatment that is delivered to them contingent on their compliance to stigmatizing social marks of adherence. Gun owners are invisible to others. We, as family members, friends and advocates need to lock arms with our loved ones to break down these delivery systems that are injurious, abhorrent, and deny care, impair research, and remove personal autonomy.